Good ideas . . . some people get ’em like crazy. Others, not so much. I’m near the bottom of the barrel of the latter grouping. I had a good idea about 50 years ago, when it dawned on me that grilled cheese and tomato sandwiches might be improved upon by adding a schmear of Gulden’s spicy brown mustard. Genius visited me that day, but hasn’t made an appearance since. Such, as we know, is life. 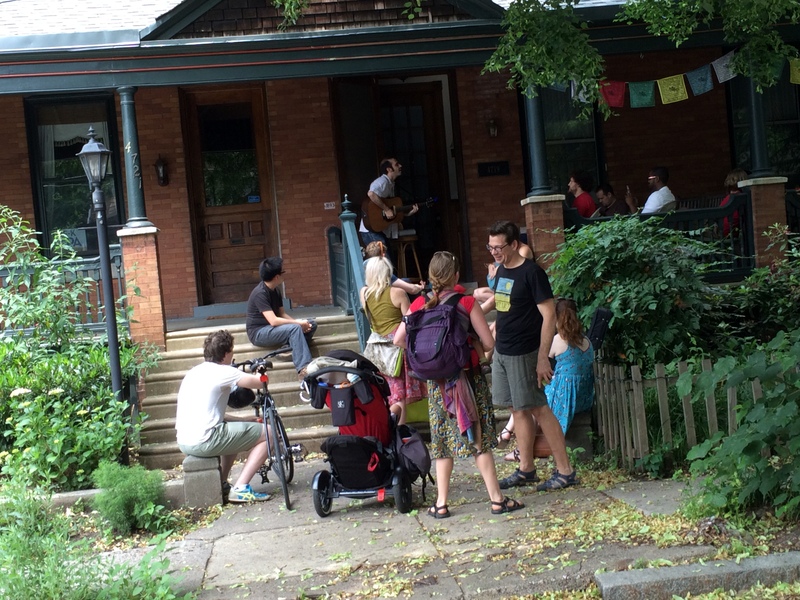 Which smoothly brings us to a remarkably good idea that some folks came up with nine years ago: a neighborhood outdoor music festival called Porchfest. When I first heard earlier this month about Porchfest’s existence I smacked myself on the forehead and said: “Yo, cowboy. This is so obvious. How come you never thought of it?” And then I remembered once again that, sadly, genius ain’t no friend of mine. What’s a Porchfest? Well, it is a day of music played on some of the porches of a porch-heavy community. The shows are free to the public. What could be better? After all, porches, when you think about it, are small covered stages easy to get close to, making them perfect for intimate musical experiences. 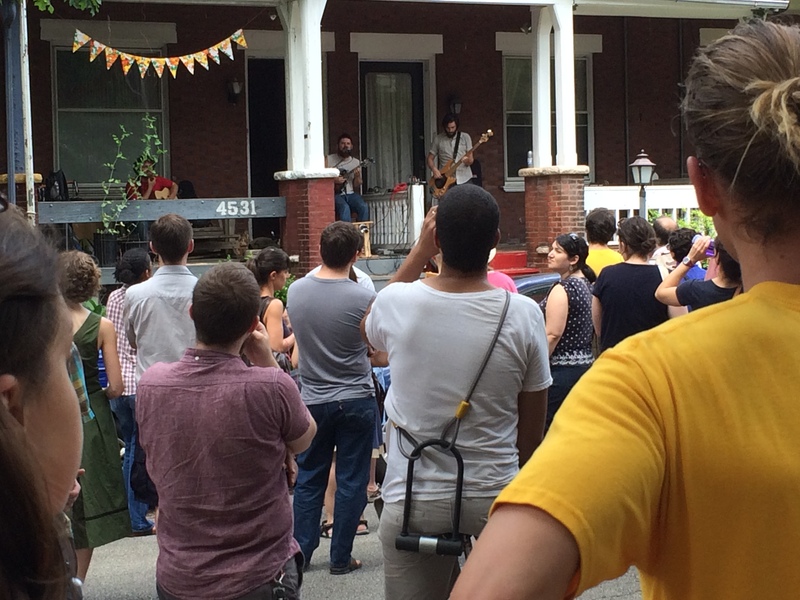 All that a Porchfest organizing committee need do is convince a bunch of homeowners in a neighborhood to allow musicians to play at their houses, and find a bigger bunch of musical acts to climb aboard. Then you set up a schedule so that audience members know the addresses of the porches, and encourage said listeners to roam from site to site, the better to get a big dose of vibrations. The first Porchfest took place in 2007 in Ithaca, New York. Since then, musicians and music lovers throughout the USA, and in a few Canadian cities, have picked up on the notion and staged their own Porchfests. Each Porchchfest is independent of the others and, I’m pretty sure, is a low budget and DIY type of operation. But watch out! The power of Porchfests is undeniable and irresistible. As a few more years go by, I predict that Porchfests will cross the oceans and conquer the world! Darlington at West Philly Porchfest. 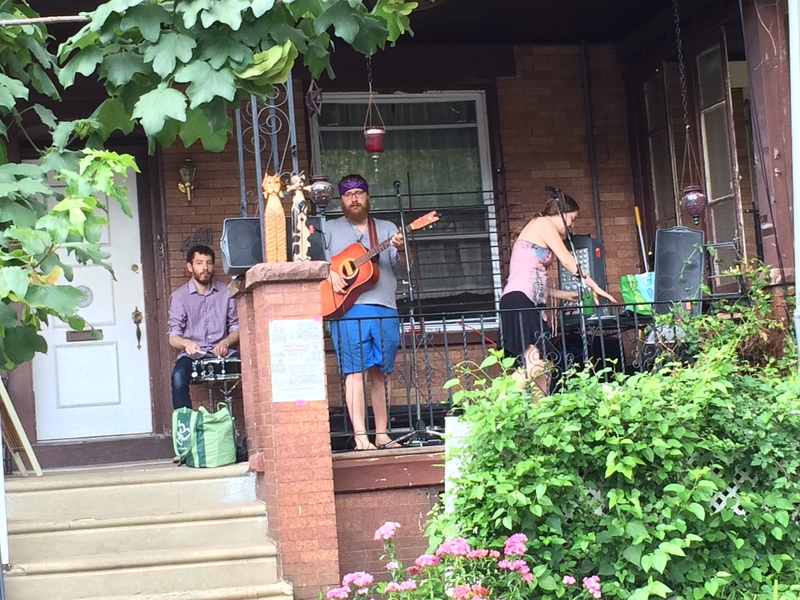 Jon Veit at West Philly Porchfest. Which even more smoothly brings us to a recent Saturday in a section of West Philadelphia (part of The City Of Brotherly Love) that contains scads of old and sturdy rowhouses and twins in possession of porches. As ideal a location for a Porchfest as any on our planet. And where, indeed, the first West Philly Porchfest took place, the baby of a group of organizers who recognized that the Porchfest idea was very worth pursuing. 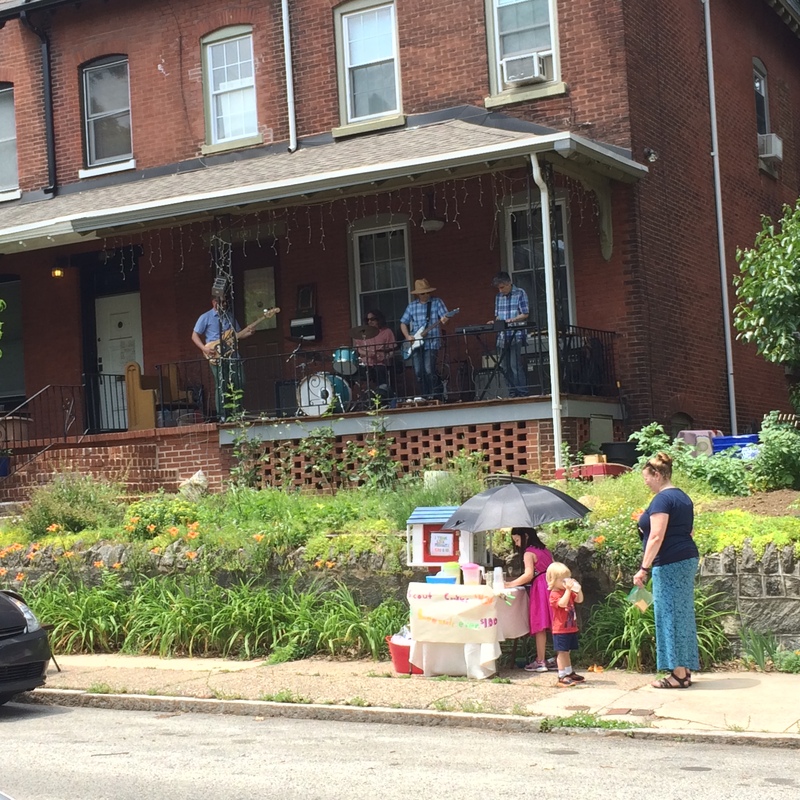 (Lots of info about West Philly Porchfest’s genesis and design may be discovered by clicking here and also here). West Philly Porchfest’s boundaries were broad, about 12 blocks east to west and likewise north to south, encompassing much of what has come to be known as University City due to the area’s proximity to the University of Pennsylvania. Over 30 porches participated. The event began at noon on June 4 and ended at 6 PM. I was an attendee, taking in parts of six shows during a two-and-a-half-hour period. Man, I loved it. I heard an acoustic folky rock trio (Darlington); two singer-songwriters (Jon Veit and Emily Zeitlyn); a damn good jam session between, of all things, an African-drum percussionist, a fiddle player, an acoustic guitarist and a flugelhornist; a vocal-less rock band (I Think Like Midnight) that, to my ears, sounded like a cross between The Grateful Dead and Television; and a folky duo that smoked and crunched. I’m going to zero in on the duo, who go by the name Driftwood Soldier, because I liked them the best of the acts that I caught. I seemed not to be alone in that. They drew the biggest crowd, around 80 people, that I saw all day, and the loudest applause too. Owen Lyman-Schmidt is Driftwood Soldier’s singer, mandolin strummer and songwriter. Bobby Szafranski is the band’s not-your-average electric bassist. Both guys pitch in to move the groove by banging on percussion instruments with their feet. I tell you, Driftwood Soldier has it. Owen sang, in a wild and wooly baritone, about underdogs, colorful characters, people who deserve better than they’ve got. He reminded me a lot of the late Dave Van Ronk. And Bobby sent the tunes aloft with bass lines that gleamed and grinned. I would not be surprised if Driftwood Soldier breaks through nationally one of these days, though to-date they are unknowns. They are that good. And they’ve got the work ethic that might lead to fame and glory, touring our fair nation with gusto. Thanks to the wondrousness of the Internet, you may watch Driftwood Soldier performing their song Rosalee by clicking right here. You know, I lived in University City during the 1970s and 80s on a beautiful, tree-filled block oh so close to a few of the shows I watched the other day. I liked the area mucho back then, and still do. I go back now and again. On the day of Porchfest it was fun walking the streets upon which I’ve trod so many times before. And it was equally swell strolling through Clark Park, a lovely place, a hub of peace and calm in University City. Kids were playing, food truck and farmers’ market vendors were vending, and teenagers and adults were milling around. 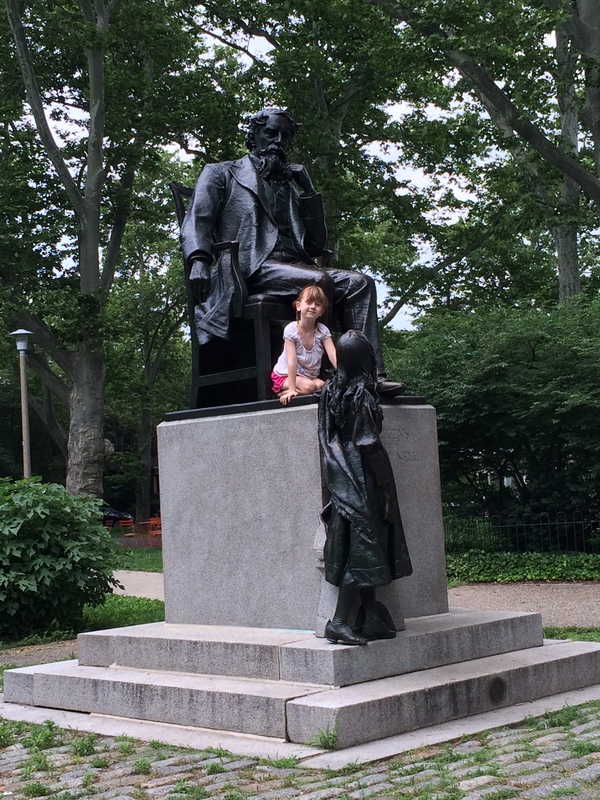 The coolest sight I saw in the park was a little girl climbing all over the Charles Dickens statue. That’s right, Charles Dickens. It’s the only statue of him in the USA. And, apparently, one of only two in the world. The other, by the way, is in Australia, not Great Britain. A good idea would be for the Brits to commission and erect a Dickens statue too, since Dickens — duh — was one of their own. Porch Fest is a great idea. Your article brought back wonderful memories of University city . When l was in my 20’s l spent every Wednesday on Regent Street down the block from Clark park doing Ananda Marga yoga. 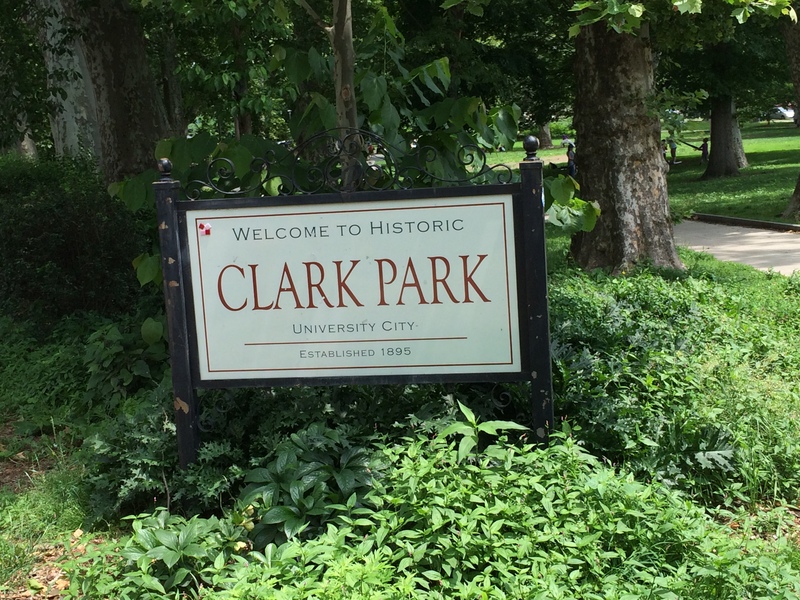 We often went to Clark park. Your yoga might have been on the same block as the rock band that I saw at Porchfest. You can start a Porchfest in your town! Here in Akron we have an event called Porch Rockr. Every September, our artsy neighborhood, Highland Square, has an Artfest and hundreds of bands and musicians are out on their porches playing. It’s amazing. I love that other cities do this, too! Why didn’t I know about this? I’d be there—bells on! In our city (Victoria, Canada), we have a close approximation of this, only it’s art. Every summer, hundreds of people stroll along a beautiful flower-strewn street to watch local artists paint and sculpt and generally show off their talents. It would be just a hop and a skip to having these mini-exhibitions gravitate to the porches, of which there are many. But I forget about how garden-proud people are here, so it wouldn’t do to let the crowds too close to their plants! The arts event in Victoria sounds great. I never heard of this, either, but it’s a great idea. A good way for a budding musician to get over stage fright, too. If the crowd becomes too much to handle, just disappear through the front door for a couple Yeunglings. You have inspired me to drink a few beers, and I’m not even a musician! Neil, you have the gift of making every restaurant, group, duo, park, city area, movie, and venue you experience sound like something that everyone else should experience as well. 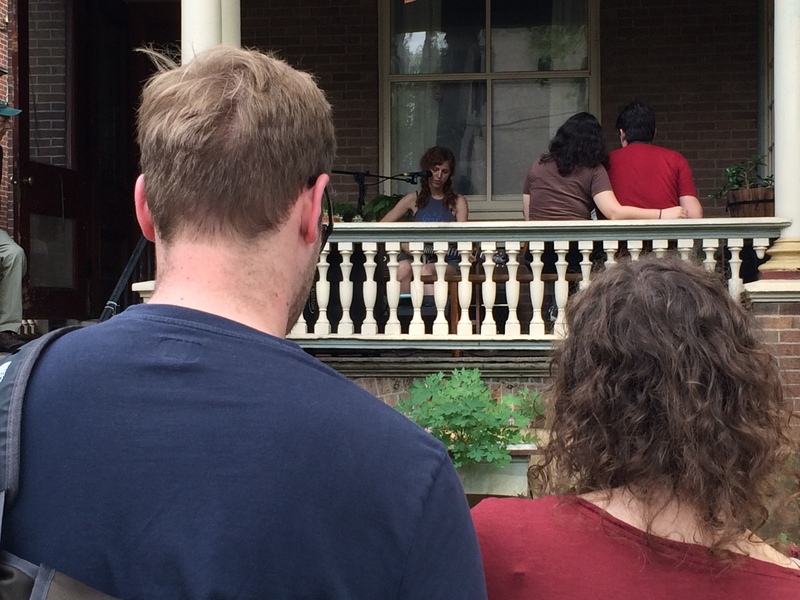 I always think, “Oh, I’d like to go there,” of I’d like to experience that.” And never have I felt that way more than I did when I read about Porchfest – a most marvelous idea. Many thanks, Janet. I appreciate it. Okay, now I want to move to some city where porches abound. And neighbors who associate with one another. And music in the air. And I bet on Halloween, trick-or-treaters actually come to your door. I live in the country with a just a few homes around, but none in view, so… (sigh). Hi. Thanks for reading and commenting. Yes, West Philadelphia has a lot going for it. All of the things you mention take place there. I’m looking forward to next year’s Porchfest. Love the porchfest idea! Can’t wait to listen to Driftwood Soldier when I can use a computer with working speakers. Nice, nice post. Well done. There is a porchfest in the town where I live and it is sponsored by a local band called the Porchistas. The name comes from the fact that the band actually came together on one of the guy’s porches. If you organize it, I’ll attend! That’s an innovative and fun idea. Would like to see it here in Venice, CA. It could happen. Porchfests have been staged in many towns and cities. I enjoyed hearing about the West Philadelphia porch scene, remembering my days at Penn in the mid-70s when I lived across from a massive retired Episcopalian Church with available tennis courts, on Spruce St. As I was reading the posting I was trying to remember the lovely park with the delightful Dickens statue — there for no apparent purpose that I could discern — but lovely to encounter by chance. Here in Phoenix we don’t have porches but we do have what are called “house concerts” where some traveling troubadors hold forth on a back patio for a modest contribution, usually including wine to share. Spectacular idea! I’m going in search of a Porch Fest! I hope that West Philly Porchfest takes place next year, because I’m already looking forward to it.